here is one of the most common of all joseki plays. It asks for the corner and possibly towards the sides as well. Blocking at here is expected. It prevents Black from making further inroads to the upper side. can also bump into the 3-4 point stone at a. This can result in the avalanche joseki, which can get complicated. Although less common, it is also possible for white stretch at b in some cases, as this reverts to a variation of the 3-4 point distant high approach, corner keima joseki. This is sometimes done when white wants sente. at x is considered a mistake. See BQM 103 for details. is usual. Playing at a was an innovation of Kitani Minoru, and still occasionally is seen in pro games: it implies a highly territorial attitude. See 3-4 point high approach inside contact, sagari. A black counter-hane at y or cross-cut at x is not joseki, see non-joseki exercise 1 and non-joseki exercise 3. It is not advisable to tenuki with , because white at is extremely damaging. At this point White will often make a solid connection at a or a hanging connection at b. These are both standard plays and equally common; they have slightly different implications but in both cases White will extend along the top side next. Below we show the most typical joseki for each of a and b, and the reader is referred to 3-4 point, high approach, inside contact, solid connection and 3-4 point, high approach, inside contact, hanging connection for details. 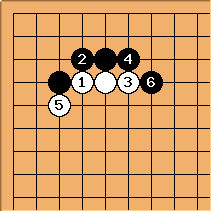 White at c is part of the Takemiya 'cosmic style' and is possible in the overall context of some strategies. Another strategy is for White to play tenuki at this point. White often plays in the upper right and hopes to be able to clarify the position in that corner before deciding between a and b. Of course, this does run the risk that Black plays next in this corner, usually by cutting at a. See 3-4 point high approach, inside contact, tenuki variation. The main difference between a and b is that a is more solid while b allows white to extend one intersection further. See /discussion for more about a or b. Also sometimes white will probe the opposite side before choosing, see ProbingDuringTheAttachAndDrawBackJoseki. The most typical joseki when playing as the solid connection is shown here. In this diagram, may also make a three-space extension at a instead. See 3-4 point, high approach, inside contact, solid connection for more. Timm(5k): a is joseki as well but I don't know its meaning. White will answer normally, at d or e and leave the defect for later. It would be very slow for Black to come back at b or f now given that the corner group is already very strong. And if Black is in a position where he can make a moyo on the left side with g, first h instead of a is more common, and second I would be worried that he has invested all his stones there and has let White occupy the rest of the goban (= that Black's opening is slow, globally). Overall I am not sure that a is a very efficient move, unless the area is of interest. Andre Engels: As Timm writes, a is a joseki, but considerably less common than h and i. Its main drawback is that the connection is a bit thin, leaving bad aji. In particular, if white would play b or j, the threat of white k is very unpalatable for black. 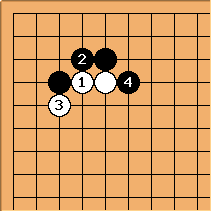 The most typical joseki when playing as the hanging connection is shown here. See 3-4 point, high approach, inside contact, hanging connection for more.